University of Nevada, Las Vegas | Debate Team - Help us continue to compete! Debate Team - Help us continue to compete! UNLV’s squad consists of eight, two-person teams, along with coaches and support staff. Undergraduate students from any major can participate on the team and hone their skills in public speaking, critical thinking, research, and cross-examination. 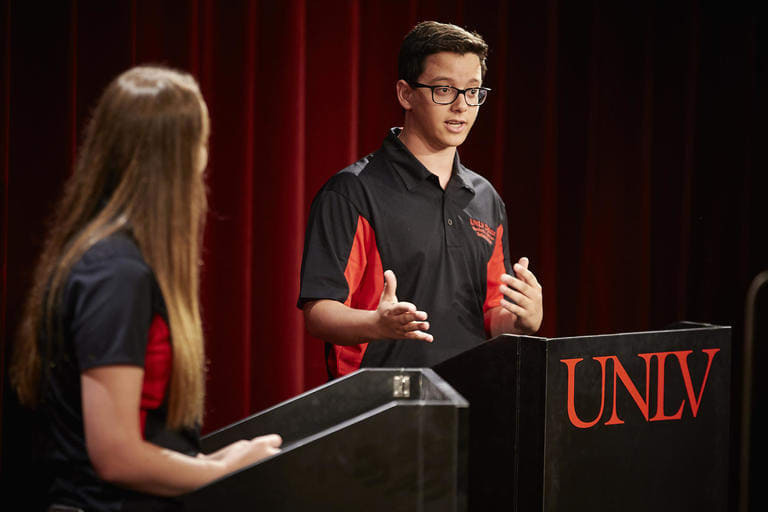 As the UNLV Debate Team continues to grow and rise in the rankings, students from across the country have taken notice. However, unforeseen changes in the philanthropic funding that supports the team threatens the continued success of the program. Please help us meet this critical need. Your gift ensures that our top ranked team is able to continue on its upward trajectory, and that the student competitors who have chosen to represent UNLV are provided with the support they need. Go Rebels! Our top ranked team members often spend up to 50 hours per week researching the debate topic, refining their arguments, and practicing their delivery. Help match their commitment with a gift of $50. Dedicated team members will work on debate every single day of the year.Help support their hard work and commitment to excellence and competitive success with the gift of $1 per day throughout the year! The cost of rental vehicles to travel the entire team and coaching staff to the Pacific Championship Tournament in 2018. For the first time, UNLV swept all three divisions of the Pacific Champs Tournament, winning the novice, junior varsity, and varsity divisions against the best policy debate teams in Arizona, California, and Nevada! The cost of entry fees for one team and one additional coach to compete at the Dartmouth Round Robin tournament in January 2018. This tournament only invites the top 7 two-person debate teams in America to compete, and UNLV was invited for the first time in 2018. We plan to work hard to earn another invitation in 2019. The cost of airfare for six debaters and the coaching staff to compete at the 2018 National Debate Tournament (NDT), the national championship of intercollegiate policy debate. One of the UNLV teams advanced to the Elite-Eight at the 2018 NDT, finishing as the fifth best team in the country!